We are pleased to inform you that your order has been dispatched via [courier] today. It should arrive at the recipient's address shortly, dependent on your chosen shipping method. Please see the bottom of this email to view our estimated delivery timescales. Click here to track delivery progress. Your tracking number is: [tracking_no]. Thank you for shopping with The Kiddie Company (UK) Ltd T/AS Rock A Bye Baby Gifts team. Please feel free to use this 10% discount code against your next purchase with us, TQU918. Alternatively, why not share it with your friends and family? We look forward to having you shop with us again soon. Should you have any further needs please do not hesitate to contact either myself or any team member on the customer service desk on 01702 469762 from 9am to 4.30pm Monday to Friday. 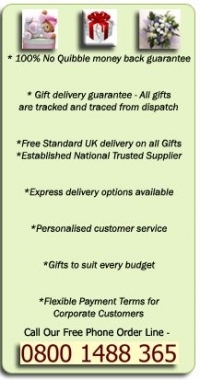 Please note these delivery timescales are approximate and are not guaranteed. It is unfortunate that whilst we make every effort to ensure your gifts are delivered safely and on time, we can not guarantee any of our third party delivery services as their operations are out of our control. These third party delivery services do not offer us guarantees of any nature and therefore we are unable to extend any guarantees to you our client.